K (Kyu, Katima, Kheim, etc.) is an strong-willed, occasionally violent revolutionary. Actions include burning down the Chinese emperor's palace. Is strongly feminist when female. B (Bold, Butterfly, Bahram, etc. )is a brave, compassionate individual. Often acts as assistant to brilliant scientists. On at least one occasion effected great social change while a Japanese samurai. I (Iwang, Iagogeh, Ibrahim, etc.) is the scientist, the explorer. Laid the groundwork for modern physics; centuries later, was a pioneering nuclear scientist before dying of radiation poisoning. The novel's seven hundred years of history kick off at about the time when European civilization was wiped out by a massive plague. You remember reading about the lost West in your history classes, don't you? The Western nations, despite (or because of) constant warfare both between themselves and with the nearby Islamic cultures, developed commendable artistic traditions and great thinkers such as Thomas Aquinas and William of Okham. Then, in about the year 1348 by their Christian calendar, a great plague struck Europe -- the Black Death. It killed between one quarter and one third of the European populace. A terrible blow, but Western civilization recovered -- or started to. Then, a few decades later, as the year 1400 approaches, a second, more devastating plague hits Europe. 99% of those afflicted, die. European civilization has been eliminated. The West has been deleted from the world. K, B, and I, this is where your history starts. Enjoy the next seven centuries. Let's see what the human race does. Kim Stanley Robinson is an author that I enjoy, but I'll admit he intimidates me. His books are long and take a long time to read. 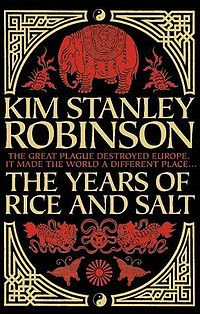 The Years of Rice and Salt sat on my bookshelf for over a year, unread, as I gathered the mental energy I knew I'd need to tackle it. Fortunately, Robinson has made it easier on the reader by dividing his book into ten sections with widely different formats and writing styles. It's still not an easy book. The early sections will steep you in various Eastern philosophies. The late sections include rather a lot of speechifying and digressions on theories of history. This annoyed more than one reviewer. As I read online reviews after finishing the book, I came across opinions that Robinson would have done better to just leave out the final sections entirely, and I have to say I see the point. I will admit that I kind of skimmed the late speechifying about history, but I intend to go back and read it later, removed from the context of the narrative (which had practically ceased to be a narrative by that point). And yet, I feel like this book has so much stuff that I can't not recommend it. I'd say, read it so you can argue about it. Argue about whether this world without Europe would really have industrialized at roughly the same time as it would have in the parallel universe where the West survived. Then you can re-read the speculations on the nature of history in the novel's final section, and start arguing about that. Heck, I haven't read such a fertile book for really intellectual arguments in a very long time.